In recent times, the fastest growing part of the higher education system has been business schools. With an established set of university based business schools in the USA since the early part of the 20th century, the growth since then has come in Europe between the 1960's and the 1990's, and in Australasia and Asia over the past 20 years. This has meant that, for example, in the UK by 2010 management and business studies staff made up 7% of the UK higher education sector and taught 14% of the students. In that same year, 1 in 8 undergraduates, 1 in 5 postgraduates and 1 in 4 international students were studying management business studies in UK business schools. This growth has inevitably attracted the interest of those applauding and sceptical of these developments, and more scholarly literature on business schools has also developed. The purpose of this book is to assess the character and quality of selected research themes on the study of business schools and to articulate a forward looking research agenda on the study of business schools as institutions. 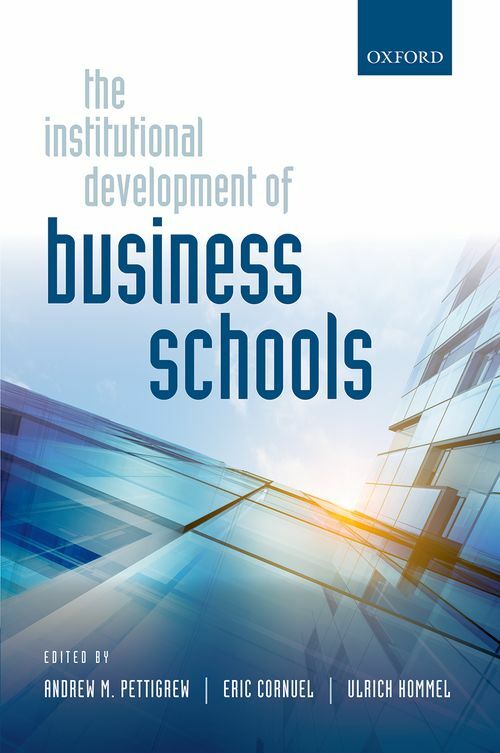 The book provides novel empirical findings on the change and development of business schools, the causes and consequences of the ranking, and branding wars around business schools in particular and higher education systems more generally. The book also offers a stimulating critique of some of the intellectual, professional and economic challenges facing business schools in the contemporary world. The book's authors are internationally renowned scholars from the fields of organisation theory, strategic management, management development, and higher education management and policy. 10. Business Schools Inside the Academy: What are the Prospects for Interdepartmental Research Collaboration? Andrew Pettigrew is Professor of Strategy and Organization at the Said Business School, University of Oxford and Senior Golding Fellow, Brasenose College. He was Dean of the School of Management, University of Bath from 2003 to 2008 and before then held academic appointments at Yale University, London Business School, Warwick Business School and Harvard Business School where in 2001 he was a Visiting Professor. He also holds and Adjunct Professorship at BI, The Norwegian Business School. Andrew's research has pioneered the use of contextual and temporal analyses of organizational processes of strategy making, decision making, change and power. He is the author or editor of 16 books and has published in most of the top management journals in the world. He has been awarded many distinctions as a scholar. These include election as Distinguished Scholar of the Organization and Management Theory and Organization Development and Change Divisions of the Academy of Management. ; Eric Cornuel is the Director General & CEO of EFMD (European Foundation for Management Development) in Brussels since 2000. He holds a degree of Sciences Po from IEP Paris, an MBA from HEC Graduate School of Management, Paris, and a DEA in strategy and management from Paris Nanterre University, together with a Doctoral Certificate in Strategy from HEC Graduate School of Management Paris and a PhD in management, written on international network organizations, from Paris Dauphine University. Eric started his career as an entrepreneur by setting up a hydroelectric power plant in France when he was still a student. He was also Director of the HEC Institute for Central and Eastern Europe (Paris). He then served as Dean of KIMEP, at the time the leading Business and Economics school in Central Asia, from 1997 to 1999. He was awarded an honorary professorship for his achievements there. From 1996 to the present, Eric Cornuel has been affiliate Professor at HEC Graduate School of Management, Paris. ; Ulrich Hommel is Professor and Chair of Corporate Finance & Higher Education Finance at EBS Business School, Germany. He holds a Ph.D. in Economics from the University of Michigan, Ann Arbor, and has completed his habilitation (Dr. habil) in Business Administration at the WHU, Germany. He is also an Adjunct Professor of Finance at Corvinus University of Budapest, Faculty of Business Administration. In the past, he has held visiting appointments at Stockholm University School of Business, Stephen M. Ross School of Business (University of Michigan), Krannert School of Management of Purdue University and Bordeaux Business School. He has been Dean and has subsequently held the position of Rector and Managing Directorat EBS. He is currently also the Director of Research & Surveys at the European Foundation for Management Development (EFMD) in Brussels as well as one of the Senior Advisors for EFMD Quality Services administering the EQUIS and EPAS accreditation systems.